Genuine OEM Konica-Minolta Imaging Unit, Magenta, 30,000 page yield. Konica-Minolta part number: A0WG0EG, IUP-14M, IUP14M. 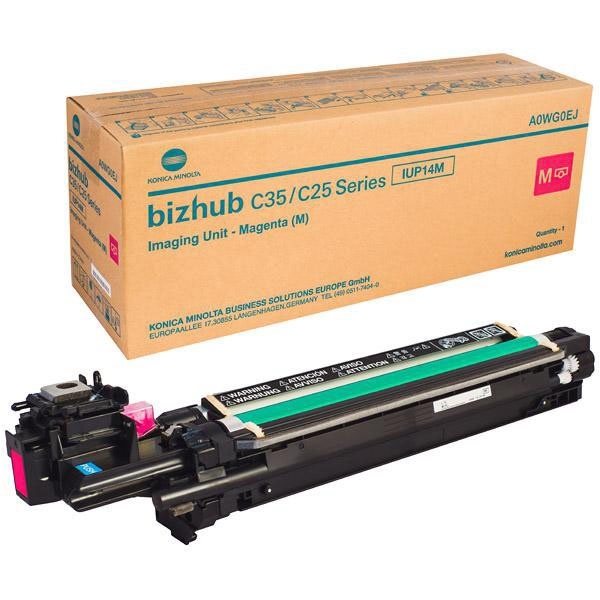 Imaging Unit compatible with Konica-Minolta bizhub C25, C35. Compatible Konica-Minolta Toner Cartridge, Cyan, 4,600 page yield. Replaces Konica-Minolta part number: A0X5432, TN-219C. Color Laser Toner Cartridge compatible with Konica-Minolta bizhub C35, C35P. Compatible Konica-Minolta Toner Cartridge, Magenta, 4,600 page yield. Replaces Konica-Minolta part number: A0X5332, TN-219M. Color Laser Toner Cartridge compatible with Konica-Minolta bizhub C35, C35P. Compatible Konica-Minolta Toner Cartridge, Yellow, 4,600 page yield. Replaces Konica-Minolta part number: A0X5232, TN-219Y. Color Laser Toner Cartridge compatible with Konica-Minolta bizhub C35, C35P. Compatible Konica-Minolta Toner Cartridge, Black, 5,200 page yield. Replaces Konica-Minolta part number: A0X5132, TN-219K. Laser Toner Cartridge compatible with Konica-Minolta bizhub C35, C35P.